One of the most popular characters in the New Pulp Movement returns in an all-new volume from Pro Se Productions. 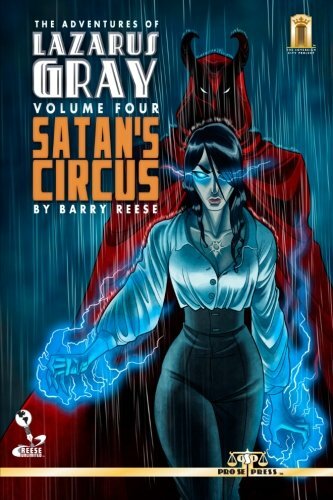 Reese Unlimited, Pro Se’s first author centered imprint, announced today the release of THE ADVENTURES OF LAZARUS GRAY VOLUME FOUR: SATAN’S CIRCUS. SATAN’S CIRCUS once again returns Lazarus Gray to the field of battle. The only clue to his identity was a small medallion with the words 'Lazarus Gray' stamped on it. He took that name and became one of Sovereign City's greatest heroes, forming an alliance with other lost souls like himself. Together, they are Assistance Unlimited... and now they face their greatest threats ever! Also included is SECRETS OF THE DEAD, a comic-strip origin sequence by Reese and artist George Sellas, also providing cover and illustrations! Learn the Origin of the man behind Assistance Unlimited. THE ADVENTURES OF LAZARUS GRAY VOLUME FOUR: SATAN’S CIRCUS features cover design and formatting by Sean E. Ali and the upcoming eBooks feature design and formatting by Russ Anderson. SATAN’S CIRCUS is available now in print from Amazon and soon from other outlets. EBook editions of the latest Reese Unlimited volume are coming soon! For digital review copies of THE ADVENTURES OF LAZARUS GRAY VOLUME FOUR: SATAN’S CIRCUS, interviews with the author, or further information about the book, contact Morgan Minor, Pro Se’s Director of Corporate Operations at directorofcorporateoperations@prose-press.com.